A rare auction of an Oscar statuette brought a total of $79,200, well more than expected, at its sale Monday by a Rhode Island auction house. Briarbrook Auctions had estimated the golden statuette would sell for $5,000 to $30,000. But several hours before the live auction began, the online bidding had already reached $32,000. The Oscar was awarded in to Joseph C. Wright at the 15th Academy Awards for Color Art Direction for his work on My Gal Sal, starring Rita Hayworth and Victor Mature. Prior to the auction, the Academy of Motion Picture Arts and Sciences investigated the sale of the statuette. Since 1950, the Academy prohibited recipients and their heirs from selling the statues without first offering them back to the Academy for $1. But, the auction house said the restriction does not apply because the Oscar was awarded before 1950. My Gal Sal is a biographical story of 1890s composer and songwriter Paul Dresser and singer Sally Elliot. Dresser sold his songs through sheet music publishers, especially the firms in New York City’s Tin Pan Alley, and became a partner in the music publishing business. His biggest hit, On the Banks of the Wabash, Far Away, became the second best-selling song sheet music during the nineteenth century. Following its success, many newspapers compared Dresser to popular music composer Stephen Foster. The tune became the official state song of Indiana in 1913. 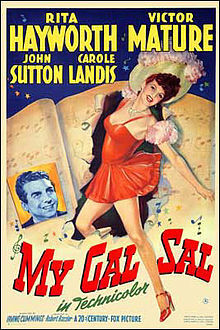 20th Century Fox head Darryl F. Zanuck purchased the story of My Gal Sal, and initially had the script and the lead role of Sally Elliott tailor-made to fit the talents of Alice Faye. However, she was tired of starring in costume musicals and turned the film down. Afterward, the part was offered to Betty Grable, who was becoming known as a successor to Faye at Fox, but she turned it down, believing the studio was over-working her. Zanuck had the script rewritten to showcase Irene Dunne, but her busy film schedule meant holding up production on My Gal Sal for eighteen months. The mogul subsequently approached Mae West with the role, but she also declined. Zanuck considered grooming newcomer Carole Landis for the part, but her screen test failed to impress producers. Despite not winning the part of Sally Elliott, Landis did end up playing the secondary lead of Mae Collins in the film. Zanuck finally approached Harry Cohn, head of Columbia Pictures, about borrowing Rita Hayworth. The film went on to become one of the most-successful Fox films during 1942. Wright received twelve Academy Award nominations and won twice, both in 1942. The other award was for Black-and-White Art Direction for This Above All, starring Tyrone Power and Joan Fontaine. He also was nominated for his work on Down Argentine Way, Blood and Sand, Days of Wine and Roses, Guys and Dolls, Flower Drum Song, and The Man with the Golden Arm. He worked on 86 films between 1923 and 1969. Wright died in 1985, and his nephew inherited the statue. This entry was posted on Monday, June 23rd, 2014 at 12:04 am	and is filed under Blog by Manny Pacheco. You can follow any comments to this post through the RSS 2.0 feed. Responses are currently closed, but you can trackback from your own site.